As the world’s militaries begin the shift to fifth-generation fighters, the need for advanced training capabilities is growing. While live training continues to form a vital aspect of instruction, simulation devices are becoming increasingly valuable. 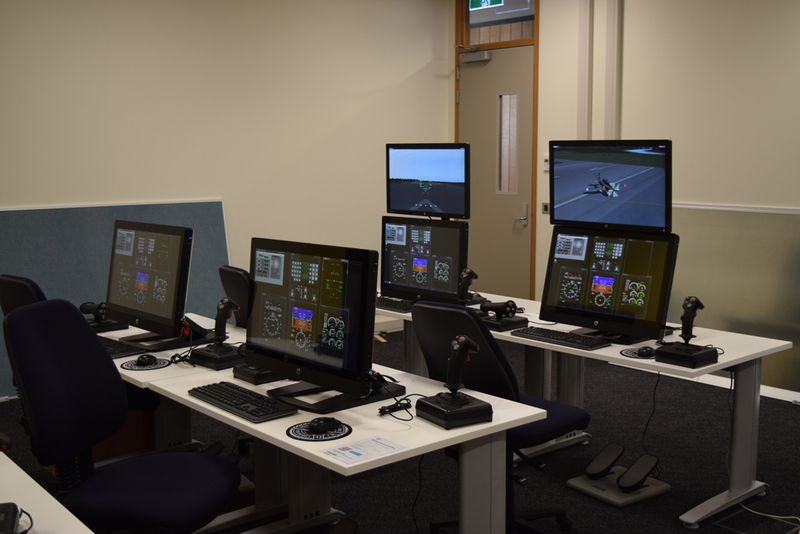 Simulation devices allow aircrew to get to grips with the realities of fifth-generation aircraft without the high cost per hour flight base of live training. In the Asian-Pacific region, the market is being driven by the approaching introduction of the Lockheed Martin F-35A/B/C Lightning-II fighter aircraft, which has been ordered by Australia, Japan, and the Republic of Korea (RoK). However, a number of nations in this region are also in the midst of developing their own indigenous fifth-generation aircraft, such as India, Japan and the RoK which also require simulation equipment as part of the wider training package. Simulation is a vital component of fifth-generation fighters such as the F-35, far greater than it is with legacy platforms, because the aircraft are so advanced in terms of their sensors and connectivity that it is not possible to adequately challenge pilots in the live environment alone. 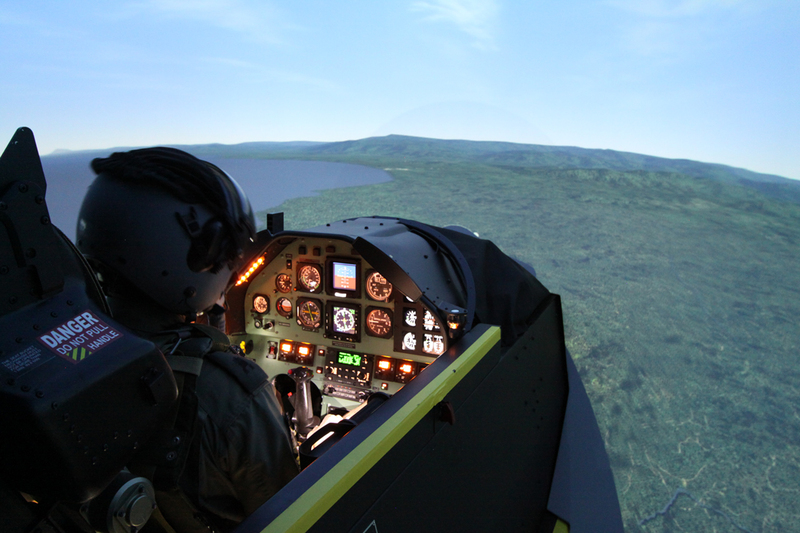 High-fidelity Full Mission Simulators (FMS) allow pilots to realistically experience the range of capabilities and gain competence across air-to-air, air-to-ground and electronic warfare missions. According to Lockheed Martin the fidelity of the F-35 FMS currently allows between 45 and 55 percent of the initial training flights to be accomplished virtually; in comparison, around 40 percent of initial qualification for the company’s F-16 family fighter which is conducted through simulation. In preparation for aircraft deliveries, more than 200 F-35 pilots from six customer nations have qualified through the F-35 Training System. Training for US pilots takes place at the F-35 Integrated Training Centre (ITC) at Eglin airbase, Florida, the US Marine Corps Air Station Beaufort, South Carolina, and Luke airbase in Arizona. The latter is where all international partners who will fly the F-35A have conducted pilot training ahead of the delivery of in-country simulation capabilities. The Lockheed Martin F-35 Training System maximises simulation. At its centre is the F-35 FMS, which replicates all aircraft sensors and weapons, and is required to be upgradeable via software block updates to accurately reflect the F-35 aircraft as it matures. The FMS is designed to allow pilots to apply the academics they have gained from the classroom portion of the training before transitioning to live flight. The simulator uses 24 projectors to create the battlespace within a 360-degree dome, and combined with a full cockpit replica, the simulator allows for the full range of future F-35 missions. While Japan and the RoK are both set to begin their own training at Luke airbase in the next couple of years, Australia was the first international partner to commence training at this facility, with the first Royal Australian Air Force (RAAF) first F-35A arriving at the base in December 2014. In September 2015 the capability to train RAAF F-35A pilots in country was advanced with the selection of Team 21 to deliver the Australian Defence Force’s (ADF’s) Basic Flying Training under the Australian Department of Defence’s (DoD) Project Air 5428 imitative. 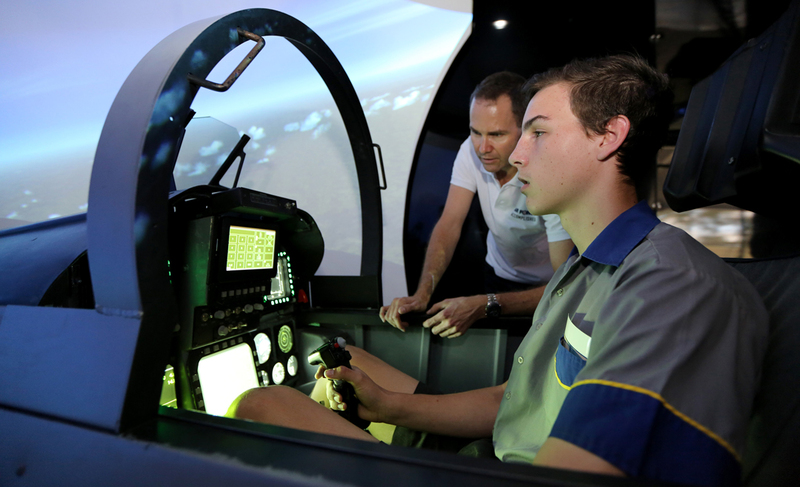 The training system aims to streamline future pilot training, co-locating multiple training facilities at the RAAF’s Sale airbase in Victoria, south-east Australia. 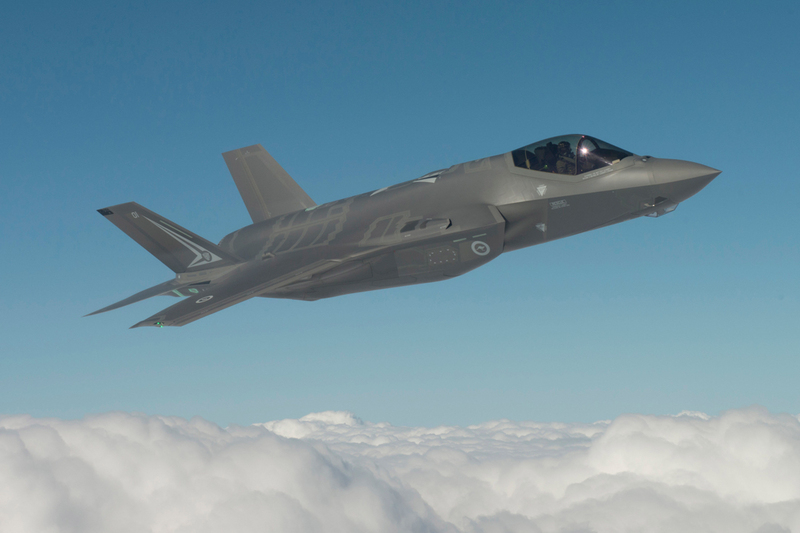 The 25-year programme will prepare pilots for the F-35A, as well as for the Airbus Helicopters’ EC-665ARH Tiger attack helicopter flown by the Australian Army Air Corps (AAC) and the NH Industries’ and MRH-90 medium-lift utility and naval support helicopters operated by the AAC and the Royal Australian Navy. Team 21 is led by Lockheed Martin and includes team mates Pilatus Aircraft and Hawker Pacific. The team will deliver 49 Pilatus PC-21 turboprop trainer, seven Lockheed Martin flight simulators, student learning environments for each flying school, and updated training curricula and materials. The acquisition contract will also establish the support elements of the services contract. 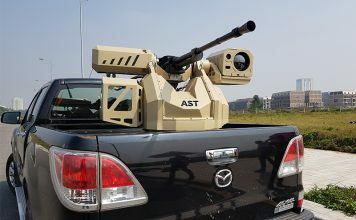 An Australian DoD spokesperson told AMR that the project achieved System Design Review in March 2016, and has moved into the detailed design phase of work. The first aircraft, first simulator and initial learning environment are expected to be delivered in mid 2017 to support Operational Test and Evaluation in the second half of the year. Additional mission systems will be progressively delivered up until final aircraft deliveries which are expected late in 2019, with the Initial Operational Capability, aligned to the first undergraduate pilot training course, currently planned for early 2019. 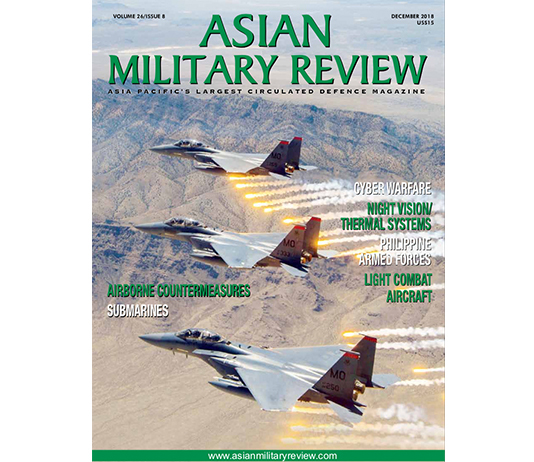 More information on Australian defence modernisation can be found in Mike Yeo’s Rumble Down Under article in this issue. Team 21 will take over ADF flight training from 2019. Until then BAE Systems, provider of the ADF’s current Basic Flying Training System will continue to run training in Tamworth, New South Wales. Following the ADF training contract award to Team 21, the BAE Systems Tamworth facility is working with the Australian DoD to promote the flight training opportunities of the facility in order to grow this customer base. 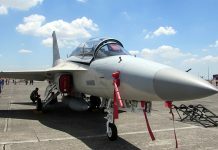 The facility is already used by other defence customers including the Republic of Singapore Air Force (RSAF), the Royal Brunei Air Force and the Papua New Guinea Defence Force. The RSAF elected to extend its Air Grading Centre (AGC) Flying Training Institute (FTI) contract with BAE Systems in June 2015 which is conducted at the Flight Training Academy in Tamworth (see above). This contract, which includes the provision of aircraft, purpose-built training facilities, instructor training and student accommodation, will also come to an end in 2019. The facility is looking to meet the needs of new customers within the region who do not have the capability to train their aircrew in-country. Meanwhile, the Brunei Multi-Purpose Training Centre (MPTC) established between the government of Brunei and CAE in Rimba, Brunei, in 2012, is also positioning itself as a training solution for customers across the Asia-Pacific. Although the primary focus at this facility is currently on helicopter simulator training, the Royal Brunei Air Force (RBAF) has been operating a Pilatus PC-7 Mk.II Flight Training Device (FTD) at the facility since 2014. The PC-7 FTD device is used by the RBAF for screening to determine if personnel have the capability and aptitude to become a military pilot. All RBAF young officers who pass their officer’s course and want to become a pilot use the PC-7 FTD; by using the device as part of the overall screening process, the RBAF can identify cadet pilots who should continue with pilot training much more quickly. Team 21’s (see above) major competition for the ADF training contract was a team comprised of BAE Systems, Beechcraft and CAE. This team’s integrated pilot training solution was based around the Beechcraft T-6C Texan-II turboprop trainer and a suite of synthetic flight training devices. Solutions based around the T-6C are seeing growing success across the international market, including in the Asia-Pacific; in early 2014 the New Zealand government selected a T-6C package for its new pilot training capability, to be delivered by a team including Beechcraft, CAE and SafeAir. 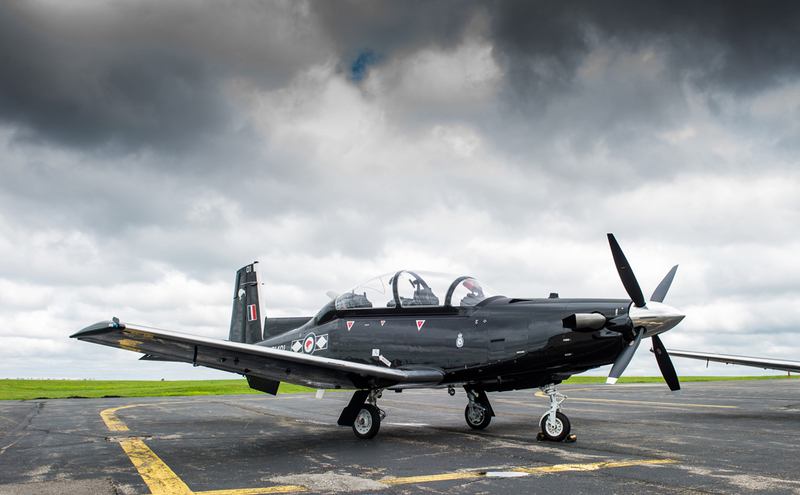 Beechcraft is the prime contractor responsible for delivering the integrated training system consisting of eleven T-6C aircraft, as well as a comprehensive T-6C Ground-Based Training System (GBTS). Beechcraft subcontracted CAE to develop the T-6C GBTS, which for the Royal New Zealand Air Force (RNZAF) includes two T-6C Operational Flight Trainers (OFTs), computer-based classroom training systems, and courseware customised for pilot training. SafeAir is responsible for conducting the Flight Line Operations and Maintenance (FLOMs) for the team. All the T-6C simulation systems for the RNZAF were delivered in 2015 and have been undergoing final test, evaluation and acceptance. “The T-6C GBTS for the RNZAF are now in use on the first RNZAF Wings Course,” Mr. Redman added. New Zealand’s military pilot training capability was officially stood up in April 2016 with all aircraft delivered. 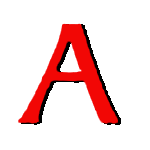 CAE is innovating in the development and delivery of closed-loop (where outputs can be routed back as inputs), performance-based training system design that enables the company to deliver and manage highly effective training systems, tailored to individual learning styles that increase student retention and success, decrease drop-out rates, maximise effectiveness, and minimise cost. 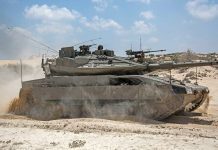 “When we combine this with scalable LVC technical solutions within the training media itself, we are finding that we are able to offer highly effective training solutions to military customers worldwide,” Mr. Redman added. The F-35 is not the only aircraft driving demand for advanced simulation capabilities. In 2012 the Republic of China Air Force (ROCAF) awarded a contract to Lockheed Martin to upgrade its 145 F-16A/B Block 20 aircraft to the F-16V configuration, which includes the addition of Northrop Grumman’s AN/APG-83 Scalable Agile Beam Radar (SABR). The upgrade improves pilot situational awareness and expands operational capabilities, and the first F-16V for Taiwan completed its first flight in October 2015. In order to enhance its training capabilities to match the upgraded F-16V Taiwan is acquiring an F-16 A/B Block 20 Mission Training Centre (MTC) under a Foreign Military Sale with the US government. The US Department of Defence contracted L-3 Communications for the MTC in March 2016, with the company to supply MTC hardware, spares, and initial software development under the $36.3 million deal. A company spokesperson said that the MTC solution to be delivered to Taiwan will include a number of the same technologies used on the US Air Force F-16 MTC simulation solution, including the L-3 Link HD World solution that integrates high-definition technologies for visual system databases, image generators, out-the-window visual displays and physics-based processing technology, plus the L-3 Link simulated Joint Helmet Mounted Cueing System. Also as with the USAF F-16 MTC solution, the Taiwan training site will have four networked F-16 simulators at a single site. 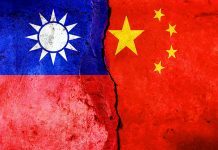 The spokesperson said that while L-3 Link is currently performing on the Taiwan F-16 MTC programme under an Undefinitised Contract Action, the company expects a full contract will be awarded to L-3 Link during the fourth quarter of 2016. As some of the most sophisticated equipment fielded by military forces, simulation technology for fighters has a lot to live up to in terms of preparing crew for the fight. 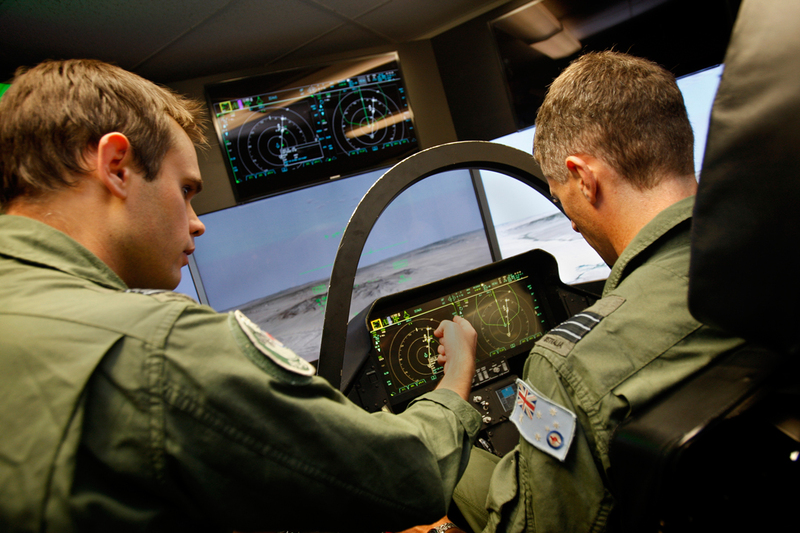 Not only are modern combat aircraft simulators delivering on this, they are revolutionising the way armed forces are able to train their military pilots, helping them do so more efficiently and cost-effectively than ever before.